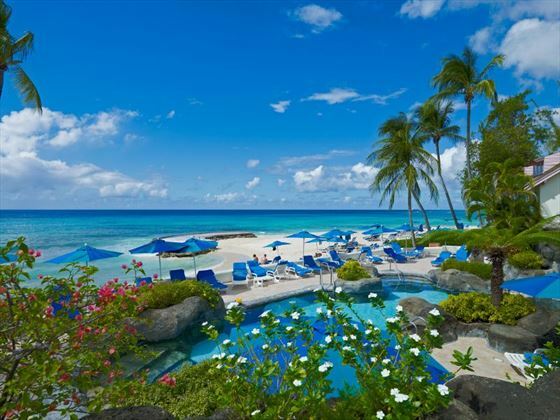 Not sure what Island to go to, why not try the best of both and stay on Beautiful Barbados with its great beaches and colourful nightlife and twin it with a stay on the Lush Island of St Lucia known for their tropical rainforest and the famous Pitons. 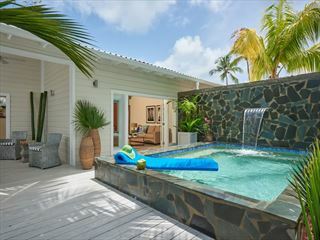 Start your holiday off with a 7 night stay on the West Coast of Barbados at the unique Crystal Cove by Elegant Hotels and top it off with a relaxing stay at the couples-only resort Rendezvous Hotel . Choose our recommended combination, or call us for a tailor-made quote. 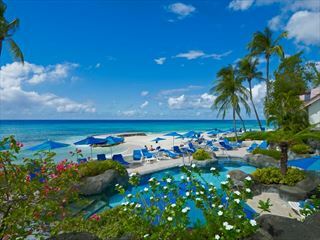 The spectacular all inclusive Crystal Cove resort is set in the breath-taking tropical paradise of Barbados. 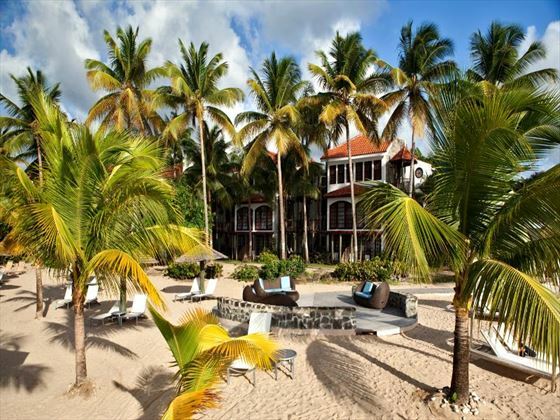 Situated on a beach cliff on the West Coast, there’s plenty to explore here, both within the resort and further afield. Spend your days lounging in one of the three lagoon-style pools or take advantage of the great selection of water sports on offer, including snorkeling and windsurfing. Want to see more of Barbados? Staff can help arrange tours or experiences around the island, such as safaris or tours of the historical landmarks – we particularly love the glass-bottomed boat rides which offer a glimpse of the fantastic marine life found here. Crystal Cove provides two restaurants with varied menus, or themed nights for something a little different. For a truly memorable experience head to the Cave bar, where you can swim through a dramatic waterfall and sip a cocktail in the refreshingly cool waters. There are water taxis available to the resort’s sister properties, or you can enjoy the regular live evening entertainment held on-site, in the form of calypso, jazz or Caribbean-inspired music. If you’re traveling with youngsters, the kid’s club is packed with fun activities for them to enjoy. Top tip: The resort holds complimentary classes in various subjects, from cake decorating to mixology, which are great fun and well worth trying out. 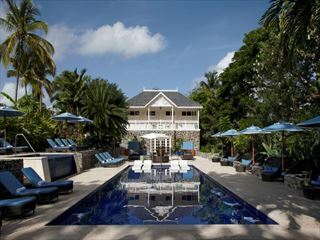 Further reading: Crystal Cove by Elegant Hotels is featured in our guide to the top 10 family hotels in Barbados. 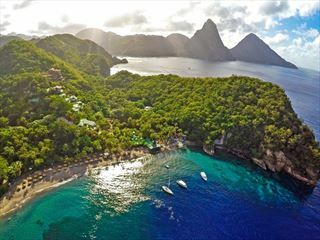 Rendezvous is your St Lucian dream – a boutique couples-only resort in a tranquil and beautiful tropical garden. 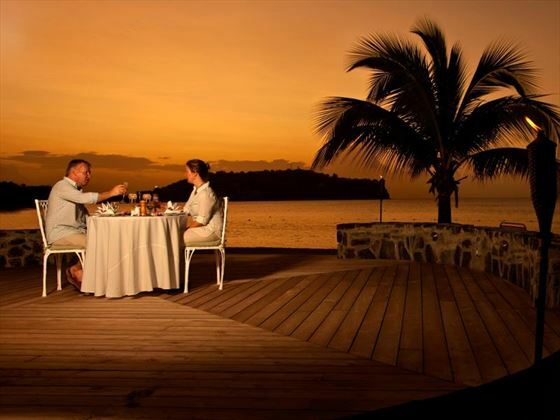 We love Rendezvous for its location on the pretty Malabar Beach. This glorious stretch of soft sand that is fully serviced by the hotel – you’re only ever a wave away from another delicious cocktail. 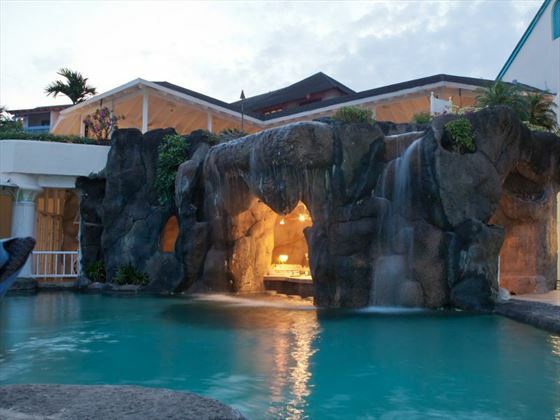 At the intimate resort itself there are two pools and a Jacuzzi to enjoy. 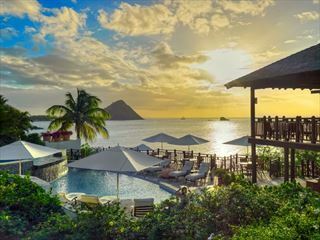 This is the perfect place for a relaxed, romantic getaway complete with sumptuous ocean views – it’s not kind of resort with overzealous activities coordinators desperate for you to join in. 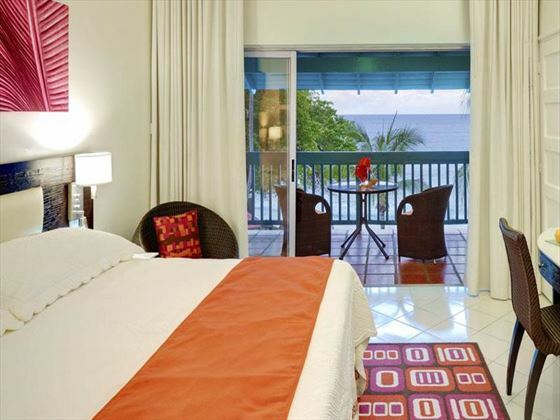 Fantastic food and spacious modern rooms complete the delightfully tranquil experience. St Lucia is famous for its friendly people. Welcoming, attentive and always smiling, the staff make sure that your every need is tended to. The resort has its own spa, and whilst the treatments aren’t cheap we can highly recommend them if you’re looking for rejuvenation or relaxation. The resort is based very close to a domestic airport, so if you’re considering getting around the island a little the transport links are excellent. Top Tip: Trysting Place, the a la carte restaurant, is very good but will require booking as soon as you arrive. Further reading: Rendezvous is featured in our guide to the top 10 honeymoon hotels in St Lucia.